The low held expectations of, I think, most people when they found out that Hasbro not only planned to make a movie based on the Battleship board game, but that it was in fact put into production as a summer blockbuster a la Transformers was due mostly to skepticism about how such an adaptation would even be possible. The inevitable question that would follow the rolling eyes of anyone who’d read about it was “How?” It seemed an insane and poor attempt to wring more money out Hasbro’s properties, especially in the wake of the underwhelming G.I. Joe. When the Ouija board movie was scrapped it seemed like Battleship shouldn’t stand a chance, yet it was given big money production and seemed unflinching in its development and marketing strategy. All the while, I for one believed the entire experiment was doomed. 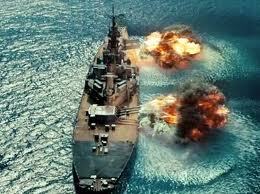 Such gross conflict is exactly what Battleship thrives on in its film incarnation. It may be flippant and clumsy, but the premise is actually very strong and the plotting really proves that not only can it be done, but it turns out it can be done pretty well. It is funny to me when I think of how much must have been riding on the success of the film and how little the makers seemed to take it seriously, particularly at the start of the film, where engaging your audience is crucial, they seem to test your willingness to submit to a film over two hours in length with no (then) discernible plot. The characters are goofy with questionable dialogue and the scenes are irreverent and almost whimsical. It’s fun, but only increases doubts that the movie will ever come together. Happily this trial is a short one and once the filmmakers begin to take things more seriously the film begins to look better and better and slowly, but definitely wins you over by the end. The hero of the story is Hopper, a romantic, gifted, but arrogant naval commander who is always in trouble and looked after by his strait laced brother, a captain. Their superior is also the father of Hoppers girlfriend and they need his permission in order to marry. Hopper is like maverick in Top Gun if he consistently under performed and disappointed. He’s not the guy you want making decisions when the fate of the world is at stake. Meanwhile, the alien threat in this movie is very menacing. The set up, which somewhat and very ingeniously mirrors its source of inspiration in a way that should satisfy even the most cynical movie fan, leads the naval fleet into near hopelessness. The film turns out to be very delicately plotted, satisfying the basic, but crucial demands of its source material, and previous Hasbro successes. The references to the game, whether implied by peg shaped missiles or graphically depicted with computer monitors and birds eye perspectives, or simply buried in the premise made this adaptation a win, as did the wildly imaginative alien tech and the strategy that keeps you engrossed and hoping Hopper can pull out a “W” just this once. 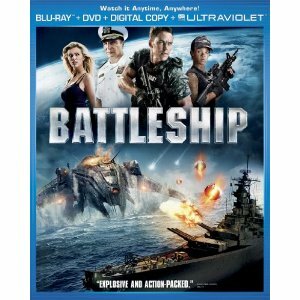 Battleship borrows heavily from Iron Man, Top Gun, Aliens, and is definitely modeled after ID4. While it doesn’t reach that level of greatness it does bring some freshness to the mix of “been there done that ” that makes it a fun, enjoyable film worth watching at least once. In fact, in terms of the many sources cited and referenced in the film I’d compare it to John Carter which is also reminiscent of several earlier films in its search for a unique identity. I only think that while John Carter might have been more interesting because of those allusions Battleship comes out a better film in spite of them.